Fall is a beautiful time of year. Pumpkin patches, cool weather, colorful leaves, with so much going on, it’s nearly impossible not to love the season. As the days cool off, you can finally pull out your favorite pea coat. Enjoy the air before it gets too cold. Scarves are a must have for the fall, too. Sweaters, sweatshirts, jeans, and boots come finally come out of your wardrobe. Both spring and fall give you a chance to make new outfit combinations and enjoy old ones you haven’t been able to in a long time. Whether you are heading to a fall festival, or just grabbing a warm pumpkin latte, we have got you covered with the best styles for the season. Looking good doesn’t have to be difficult. The easiest way to pull off any and every fall outfit is with scarves. Not only do they keep you warm, they are great for accessorizing. It’s a win all around. This little accessory should be one of your favorites. If it isn’t already, you’re about to change your mind. 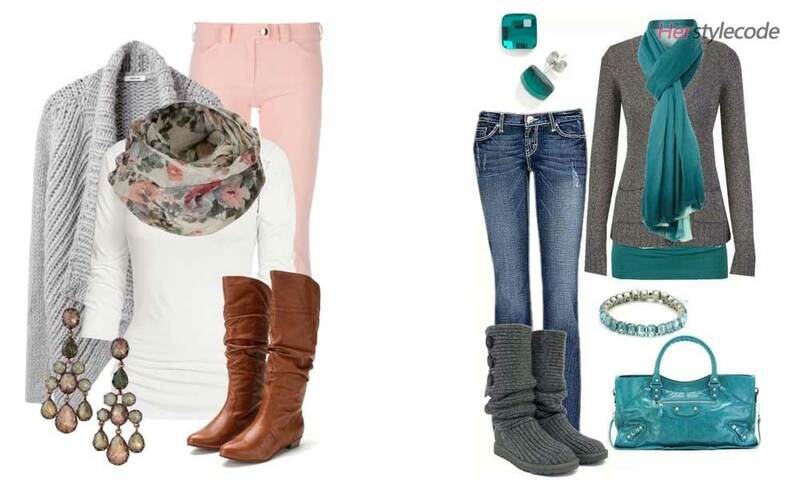 With a scarf for every outfit, you’ll be accessorizing like a pro in one of the simplest ways. Floral prints aren’t just for spring and summer. You can carry on the trend into the cold weather also. Light colors can be worn any time of year when done in style. 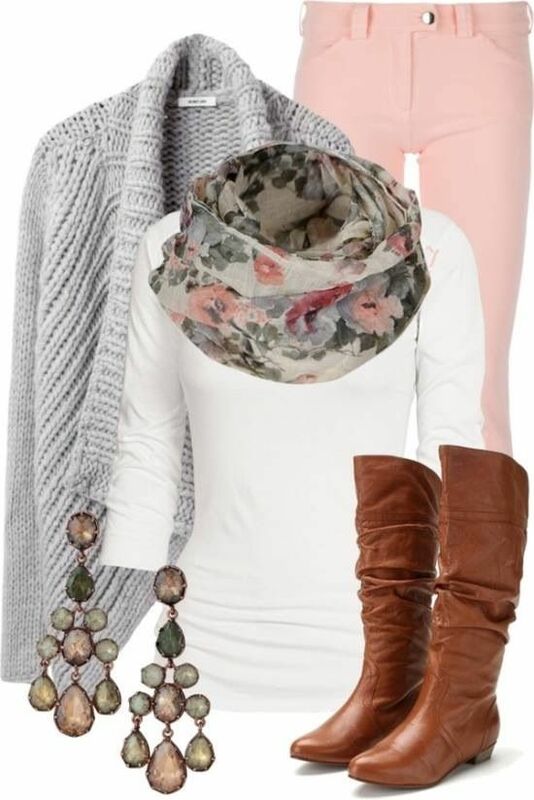 Pair a neutral knee high boot and top with some light colored pants and a flowery scarf. This cool weather outfit is sure to put a spring in your step. Use your scarf to bring out your animalistic spirit. 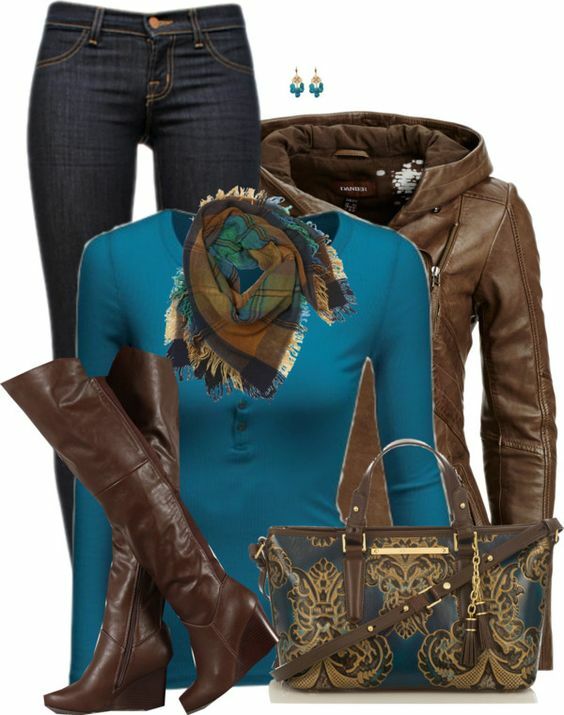 This leopard print inspired outfit uses matching colors to keep the attention focused on the scarf. If you prefer a zebra print, use a black and gray color scheme to hold the focus in the right spots. Adding too many extra colors to an already bold pattern can be distracting in a not so stylish way. Wool pea coats are one of the most classic of fall must haves. This look pairs neutral colors with plum, making the color the focal point of the look. If you are heading outdoors for a festival or day shopping, this look will keep you comfortable and fashionable while you enjoy yourself. You may have an important interview you want to do well in. Maybe you just need some inspiration for fall outfits you can wear to the office. This look has you covered for both. Match dress pants with one color that you can use for the whole outfit. Neutral colors are perfect for the fall. Different dark shades are a classic look. You can mix a few to pull off a great style. Pair different shades of gray, black, and brown to find the perfect look. 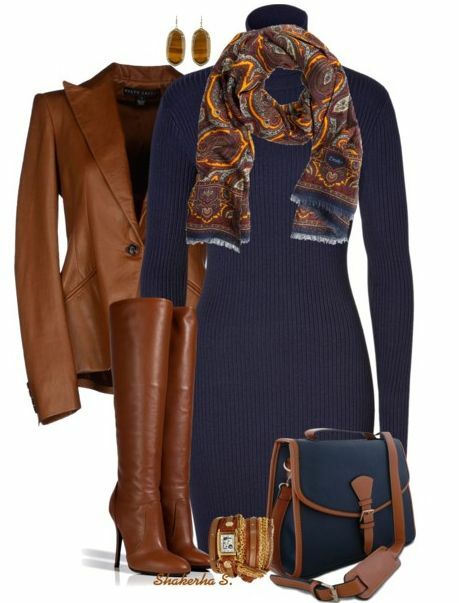 A printed scarf and matching handbag with all your color choices will pull the entire outfit together perfectly. If you prefer to keep bright colors in your style, you can. 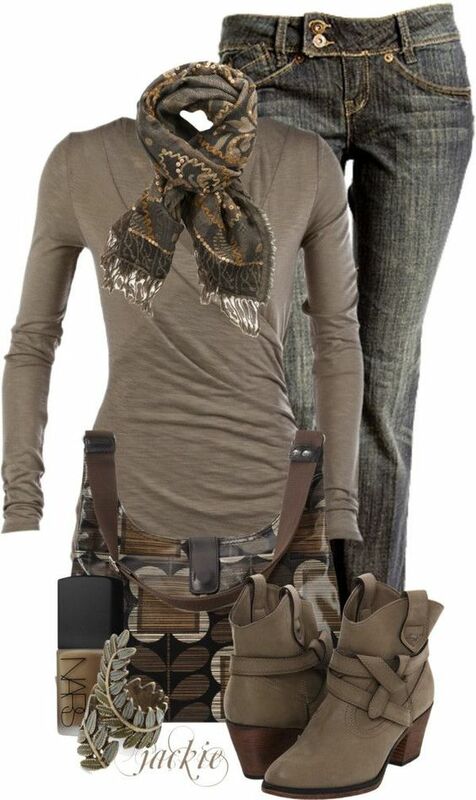 keep a neutral outfit and add in accessories in the color you want. You can choose to go blue one day and pink the next. This versatile look can be done in so many ways, it makes for a perfect go to look. Another way to play with color is to reverse them. Keep the colors in your outfit and add neutral accessories. You can put hints of the shade you are using in different parts of your outfit. These simple touches are perfect so you don’t go overboard with the look. You don’t have to put away all your dresses just because the weather is colder. There are plenty of options for fall dresses that will make you swoon. This look would be a great weekend style and also perfect for a day at work. Sweater dresses are one of the best fall outfits. You can accessorize them in so many ways. Dress them up or down to fit whatever the occasion may call for. This combination makes a great look for a day at the office or just because you want to dress up. Leggings can finally come out of your wardrobe! I know I’m completely thrilled about that. 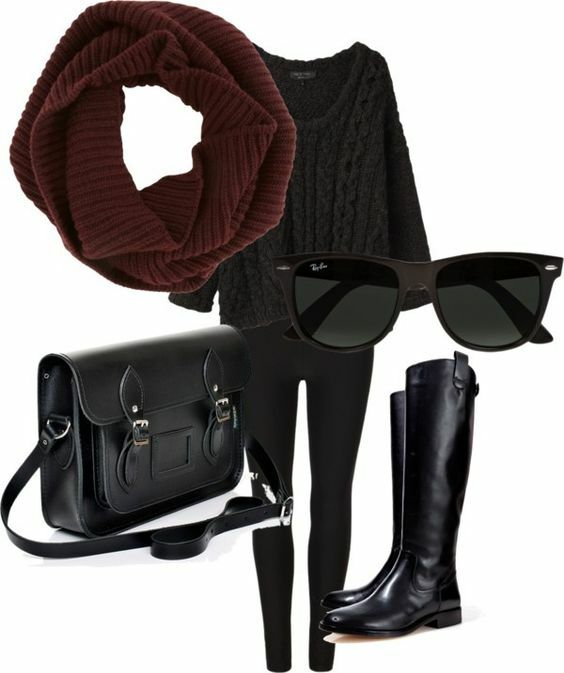 You can pair an all black outfit with a scarf in a different color. If all black isn’t your thing, there are plenty of other ways to wear leggings. This stylish look pairs neutrals with a bright color that makes the look stand out. If all black is one of your favorites, this style is edgy and looks good. Mix and match your favorite black patterns to find the one you like the most.